SALT LAKE CITY (AP) – “The Mormon Church History museum is closing for one year for a total renovation of the 30-year-old building. “The Church of Jesus Christ of Latter-day Saints says the Salt Lake City museum will close on Oct. 6, following the biannual general conference. It is scheduled to reopen in the fall of 2015 with a new floor plan and exhibits. “Among the items that will be put in storage are the plaster death masks made of the faces of church founder Joseph Smith and his brother Hyrum Smith after they were killed in 1844. STEVE RAY HERE: Nothing they change in their museum will change their theology. Mormonism is a heresy and a cult and trying to put on a new face changes nothing. Heresy and false teaching are just that – heresy and false teaching – not historical Christianity. But everything in America is about marketing and appearances so many will fall for the facelift. Amen Steve! They do not like to talk about their non-Christian teachings and hide the embarrassing parts of their history. They want to be viewed a “normal” but are not. As you know, my son Steve was fooled into the LDS Church with “pray to know the Book of Mormon is True”. Well praying does not make it true. I pray each day that he will see real truth. As a member of The Church of Jesus Christ of Latter-Day Saints (aka Mormons), I can attest that we are indeed Christian. True that it does matter who is setting the rules for what defines a “Christian,” but if believing in Jesus Christ, the son of God the Father, and striving to following His teachings as found in the Bible and other revelations and inspired writings is part of the criteria, then I fit that definition. I agree that some beliefs of ours are outrageous and contradictory to widely held religious views – but so were the teachings of Jesus Christ to the Pharisees and Sadducees of the ancient world. Jesus said “If any man will do his will, he shall know of the doctrine, whether it be of God, or whether I speak of myself. (John 7:17). We invite all who study the Book of Mormon: Another Testament of Christ and the doctrines of our church to ponder them carefully and seek to know the truth for themselves through application and asking God in prayer. There is no “fooling” of anyone who does that. The pattern is the same today as it was in Jesus’ time. A general leader of our church, Elder Jeffrey R. Holland, explains our Christianity very well in the talk you can find here: https://www.youtube.com/watch?v=GzE6QFj6maQ. I hope you can take the time to listen for greater understanding of our viewpoint. Friend, while I can appreciate your candor and respectful tone, I think we have to go back to the point of who Jesus is. That is what defines us as a Christian. Muslims see Jesus as a prophet of Islam, and therefore they are not Christian, even though they believe in the existence of Jesus. The LDS religion likewise recognizes the existence of Jesus, but the Jesus of the LDS faith is different from the Christian religion. I argue this because while we both agree that Jesus is the Son of God, we differ in that Jesus is God the Son, Second Person of the Holy Trinity. The LDS faith, from what I recall, does not believe in the existence of the Trinity (One God, Three Divine Persons) but believes that the Father, the Son and the Spirit are three separate divine persons and also believes in the existence of other gods (the term is Henotheism, from what I’ve read). If you were to find a person who claimed to be a follower of Jesus and of the LDS religion, but denied that the Book of Mormon was Scripture and or denied that Joseph Smith was a prophet, you would agree that the person would not be a true member of the LDS religion precisely because that person is denying a fundamentally orthodox LDS doctrine. In the same way, the Jesus of Christianity is the Second Person of the Trinity; to deny this is to deny orthodox Christianity. Nice discussion but the bottom line is that LDS is a polytheistic faith, with multiple gods and the belief that gods are created through their religion. It is interesting that all LDS responses to men becoming gods are never answered even though the Joseph Smith taught that “Heavenly Father” was once a man just like us. All that christian means is that you believe in Christ. Nothing more, nothing less. If you're Catholic, you're Christian. If you're LDS, You're Christian. STEVE RAY HERE: Don't want to burst your bubble and stop you LOL, but you are very incorrect in your assertion above. The word Christ is the Greek word for the Hebrew "Messiah". Christ is not just a concept that one can believe in to be a Christian. One must believe in the historical Christ that came from God. Christ has a definition: he is the eternal Son of God, born of the Father before all ages. He is the 2nd Person of the Eternal Trinity. He is one divine person with a divine and a human nature. One believes on Jesus Christ by being baptized and following him as a disciple. It is NOT just believing in Jesus as whatever you want him to be. Mormons have a totally different idea of who they think Christ is – so according to the historical Christian definition they are not Christians, they are heretics. The word heretic means one who breaks from the orthodox, established truth and theology to do their own thing. This is exactly what Mormons have done. They have abandoned the orthodox understanding of Jesus Christ and went off into a very novel and loopy idea of God and Christ. Historical expose on the Book of Mormon. The Spalding Enigma:Who Really Wrote the Book of Mormon.Cowdrey;Davis;Vanick. 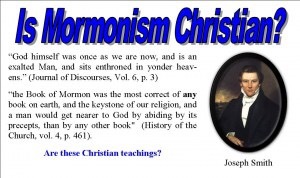 Shows the Book of Mormon is a plagiarism of a novel that was written in early 1812 by one Solomon Spalding. There is a readers edition and a much more detailed larger volume.Written for all that believe the Bible is inspired. Next post: We Voted Today!